Some groom's cakes really make you wonder: what did the bride do to the guy to deserve this? Head Caterer: "No, no, no! We definitely want both cakes on the same table. Why? Uhh...well, honestly, because the groom just slipped me a twenty." As we all know, nothing says, "Look!! A dead deer!" quite like an edible photo of - waaaait for it - a dead deer. And really, what photo could possibly be more appropriate on the day you pledge your life and love to another? Of all the things that could be expressed on your wedding day, I'm pretty sure "Git R Done" is the least appropriate. Bringing a whole new meaning to "foot in mouth" on your wedding day. Mike R. reports: "This was the groom's cake at a wedding I photographed. (The groom lost his big toe in a lawnmower accident as a kid.) You can't see it in this photo, but of course the cake is red raspberry." Oh, of course. I'm curious, though: Did the lawnmower take all his toenails, too? Wait, don't answer that; I feel some dry heaves coming on. Spongebob with "Git R done"??? How old is this groom? Ten? eeeeeew. especially the last one. ick. First Photo: "Honey, this is the last time you'll see the lid down on a toilet." Last Photo: "I may not have my big toe, but still, you complete me!" I'm thinking a bad groom's cake might be a deal breaker. Sooo glad my hubby didn't put me through that! What does a childhood lanscaping accident have to do with your wedding day? Don't groom's cakes usually involve the groom's hobbies? Is it his hobby to lose toes in bloody accidents? Splendor in the grass severed foot cake could have been a LOT worse (if you catch my drift...)! Git R Done...............ACK! Larry the Cable Guy has infected the entire world! And I guess the last groom has really put his foot in it this time. I can't even form a real thought right now, I'm just so....flabbergasted. 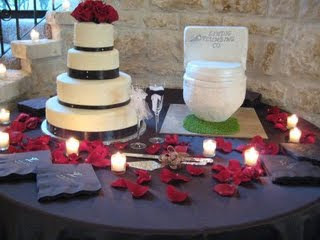 No, I will not make a groom's cake shaped like a toilet. Or one with a DEAD DEER on it. Or one with a foot with a SEVERED TOE on it. Made, of course, of red raspberry cake. Is it strange that with the dead deer cake I was more intersted in the fact that they didn't feel like capitalizing the L? It looks like they had plenty of room. Considering it was on edible paper all they had to do was hit the shift key. That is pretty lazy. "Shoot, I got all the way to the end of the sentence and even managed to add some punctuation now I am supposed to go back and fix the first letter? Oh well, nobody is going to notice it anyway with that awesome picture." Also, grey and orange? I do not want to see the bride's maid's dresses. why does someone commemorate the chopping off of their toe? seriously? sponge bob on an army cake? or a groom cake? how old is this guy? Are we sure the deer is dead? I personally would mix up some of those inscriptions. I think "Git R Done" on the first cake would add that finishing touch. I also think "Look what I got" would look a lot better on the last cake, but that is just my personal opinion. Ug. bad, awful, yuck..... etc. And then there was the foot one at the end. WHY does a childhood accident have to be displayed (graphically) at your WEDDING, dude? Who cares? Who wants to eat that??? Is there a therapist in the house? For the groom, or for me now, it's whoever. Groom's Cakes make me sad. (I've always wondered why the bride is pushed to pick some frosted castle monstrosity while the groom's cake gets to be fun and actually about him and his interests - does the bride not have any interests, too?). But these make me doubly sad, because they clearly spent a lot of money on a 2nd cake and they got these horrors. And gray and orange can look pretty cool together if you do it right. It's a lot edgier than the normal pastel and white stuff you see at weddings, which I happen to personally dislike. What would be extra awesome would be a wedding with a non-traditional cake, no "color scheme" or "theme" (it's just a party! ), unmatched bridesmaids and a bride not in white. That's a wedding I'd want to go to. For a moment I thought maybe the last cake, the Foot Cake, was a shout-out to Lost. But then I changed my mind and now it's just a creepy severed-toe-foot cake. Euw. How tasteless. Well, I'm sure the cakes are delicious, but the decorating ... ugh. Can anyone see the writing on the toilet cake? I'm as curious as I am horrified. Thank goodnes my hub didn't know grooms cakes existed when we got married. Jenna would have approved of my wedding, then. We had a Princess Bride theme... sort of... but my husband dressed in Civil War and I in (blue) Victorian garb, and our attendants wore whatever they wanted (one light blue, one dark blue, one in orange.) My husband had a groomswoman instead of a groomsman. And my cake was purple and white. We didn't have a groom's cake. Yeah, that first wedding photo is terrific--until you see the toilet on the table. I hope the bride knows a good photographer who can Photoshop it. It's not a something you want to show your (eventual) grandchildren. *No, don't answer that, please. The toe would be great for the guest who wants "just a bite." how do you explain this to your guests though? who wants to know what's wrong with the groom's foot? and if a groom's cake is supposed to be about his interests and what's important to him, how sad that it's his foot and severed toe! get past it, buddy! get a hobby! i didn't know about the groom's cake tradition, thankfully. one less thing to spend money on, and my cheap husband wouldn't have wanted to do it anyway. who knows what he would have chosen. normal guy, architect with soccer and baseball interests, but not enough that he'd want it replicated in cake. *shrug* he also liked to travel, drink wine, etc. maybe we could have done something fun. I think "Look What I Got" would have been so much cooler if they couple had staged the photo with her in the truck in her wedding gown with fake antlers on her head and him standing over her lifting her smiling head up for everyone to see. Now THAT would be funny! I also thought the foot cake was a shout out to Lost till I read the explanation. And certainly tis easier to make a foot cake than a smoke monster cake. On his wedding day, the groom wanted everyone to know and remember that he lost his toe as a kid. Really? My cousin's son had a bona fide red neck wedding - the colors were eggplant purple, hot pink, and camo. While there wasn't a "git r done" on the camo wedding cake. My cousin did shout that out as his son kissed his new bride. I wish I had just made that up. The writing on the toilet cake looks to me like "something" FLUSHING CO., except it's actually spelled fluhsing. At first I thought it might be the company the groom worked for (or owned) but it could be still just a joke. Sadly, my thoughts after going through the whole post was that the toilet seat one wasn't so bad. Men, you have to start your marriage off on the right note. If your intended doesn't want to let you choose the cake, it's time to put your foot down. Add me to the list of people wondering what's written on that toilet (if that's what it is) in the first picture. All I can think is that the guy must have a ton of money if she's willing to marry him, toilet cake and all. Oh, oh! I've got! He must be a plumbing fixture manufacturing tycoon. My poor father had his leg amputated. At least the "deer cake" is MERELY a photo... You guys have featured some which were actual, 3-dimensional dead deer. Tacky as it may be, a photo is still an order of magnitude less tacky than that! the eff on the Git R Done cake: what the heck is sponge bob doing there? and he has...what?...on his head? condoms? balloons? why is he with our military? i'm confused. Aww, I submitted a wedding cake/groom's cake combo yesterday. Clearly I read Jen's mind. So someone's hobby is sitting on the toilet? Researcher for the bathroom reading institute maybe? ok. Two-bathroom house/apartment needed. Git R Done definitely makes me wonder if this is a redneck fratboy. >.X Seriously, especially because the "R" sounds her with a silent h.
But why do these guys get say over the groom's cakes, when traditionally they're supposed to be gifts from the brides? I think the addition of Sponge Bob to that third cake officially broke my brain. Apparently, yes, guy I knew with the lawn mower accident did recently get married. I honestly would not be surprised at all if it were his cake. He thought his battle wound was cool - wore flipflops all the time. I saw it. It was gross. "He thought his battle wound was cool - wore flipflops all the time. I saw it. It was gross." OMG Erika - You mean you actually know the guy that cake is for? And losing his big toe really IS the highlight of his life? I feel bad for his wife. There are so many ways the Great Revelation could have gone, and so few it could have gone well. To the CW readers from the UK - "Git 'R Done" is a "redneck" expression popularized by "Larry The Cable Guy" (a redneck comedian). It generally means "Get It Done". It can also mean "Let's Go!" "You Can Do It" or "Just Do It" or in the case of the groom's cake, I suppose it could mean "Just Do Her" -- in other words, "Time to Boink the Bride" The British slang 'git as a noun (insult) meaning "jerk" or annoying person is not recognized in the United States, except by Monty Python fans. Oh, my, goodness. You're kidding, right? A foot!? With the missing appendage laying in the grass?! For a wedding!? I literally just got light-headed seeing and reading about the Toe/Foot one. Ick Ick Ick. Quite frankly, I though the last cake was one of those tree trunk things at first glance. Too bad I looked again. Feet that ugly should be keept covered and OFF the table. Groom's cakes have gotten badly out of hand (but then so have many weddings, period). I'm glad the people I know have "normal", tasteful cakes at their weddings. Of course, then there would be no wrecky cakes to complain of. Am I missing something here - I thought the whole point of a wedding was the 'two hearts that beat as one' sort of thing, which is why there is a cake that the new couple cut together. So...doesn't having a bride's cake and a groom's cake rather detract from this idea? I don't think I've ever been to a wedding with two cakes. Is the big one the bride's cake? haha! I'm such a fan of your site...and now, my cousin's groom's cake (the one with the big toe missing) if being featured...awesome! "... yes, guy I knew with the lawn mower accident did recently get married. ... He thought his battle wound was cool - wore flipflops all the time." "... And losing his big toe really IS the highlight of his life?" "Did I ever tell you about the time a lawnmower cut off my toe?" "Only about fifty million times." "See, I was mowing the lawn uphill with my flip-flops on ..."
(Following you into the next room) "... And the grass was wet ..."
(Following you at a run down the street) "... And I heard a strange noise from under the mower, so I lifted it up ..."
"Oh, no, I'm late for my endoscopy. Gotta run"
(Four hours later) "... and my foot still really hurt when they took the bandage off, and ..."
Lord have mercy. Esp. the toe one. This is your WEDDING day, not a frat party, people! Have some class! A toilet cake at a wedding? Seriously? When I was growing up, groom's cakes were pretty much just chocolate cakes with fruit or other non-frilly decorations. That's what I had at my wedding. Never saw one like this in person, but, well, to each his own. At first I thought the toilet was an urn...it took me looking at the picture in another tab and seeing the picture name to understand it better. Also, is it from the submitter's wedding? I pity her. And people wonder why one would choose not to have a groom's cake. 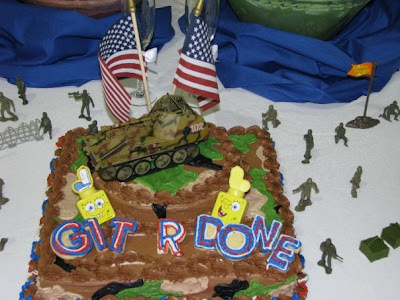 am i totally pathetic that i think all the little army guys around the "git r done" cake are way cool? granted, the spongebobs are really weirding me out, but i have to admit i like the army dudes. 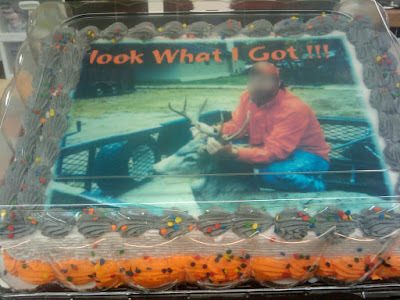 and hey, if the guy likes hunting, since groom cakes are supposed to represent hobbies, which is worse? a dead deer or empty used shell casings (as we have seen before). personally, i'd go with the edible photo paper over dirty casings. I thought the foot/severed toe cake was making the statement that the groom tried to avoid marriage by shooting off his toe, the same way that some draftees tried to avoid military service. It had perhaps some "coyote ugly" overtones--not a great theme at a wedding, yes, but I like it more than what the story really was. ...my parents, newly wed, walking back down the aisle to exit, grandpa yells 'git'r done!'. no, this is NOT the end of the story. they get outside, grandma from HIS side says 'you're not gonna come back knocked up again, are you?' ahh family. these cakes would be a relief for us if they were the worst part of a wedding! Maybe he married the deer? :? Spongebob on a Git-R-Done cake makes it just a little less redneck, maybe 1/10th less. Now if they had included winking pictures of Larry the Cable Guy, it would have been hillbilly heaven. I couldn't imagine any of the guests to actually eat any part of the toilet cake or the foot cake. I can take an edible image of a dude and a dead deer though. My standards aren't that high! Jenna: You would have loved my wedding, too. I wore electric blue, my sister wore hot pink. We didn't have a theme. We didn't even have a cake! We got married outside so we'd have a beautiful backdrop, but that is all. Anonymous @ 2:43pm: Yes, as someone else already mentioned, "Git" is a redneck version of "get". It doesn't mean what it does in the UK, although I have known people (including my ex-husband) that the term "git" would apply! My ex-husband's groom's cake just had an edible picture of a drum set. It was put on top of a large plastic record album, because he was also working as a DJ at the time. These cakes, however, would not have been allowed at either one of my weddings! Maria, please tell me the toe cake groom wasn't from Indiana. 'Cause I'm really sad to admit that the first thing that crossed my mind was, "ZOMG, that's my bf from HS!" Oh boy where do I begin? That first cake with the toilet.. whatever that groom is thinking I have a feeling that marriage may be heading right down that toilet lol. And anyone that thinks a cake with a picture of a dead deer on it is appropriate at a wedding must really want a quick funeral once the bride sees that cake. OMG! Yuk! It makes you wonder whether they actually love their "wives"/"wives to be" or whether it's a battle to regain control of the wedding! Can you imagine entering the reception following a ceremony to be greeted by any of those! I actually think these cakes are great. I wish my ex-husband had paid enough attention to the wedding planning to want his own cake. I think it's unique, different from the cookie cutter basic wedding cake that most people have. It adds a taste of what the groom is actually like, unlike most of the other wedding bits. Despite what it seems, the bride isn't the only one at the wedding. Let the groom have part of it as well! Wow, either lawnmower/toe accidents are shockingly common (somebody call OSHA), or an amazingly large number of people know the guy with the foot cake. I'm with Gary here. Maria Claudia, clue us in: is he *really* obsessed with his toe??? I had a cyst removed from an ovary when I was in college. Do I need to commemorate that with cake on my wedding day? Really? Okay, this has been bugging me since yesterday. How does the guy with no big toe wear flip-flops? It looks to me like the inscription on the toilet cake reads "LIVING PLUMBING CO."
So maybe the groom is a plumber? Or life is a toilet? Or plumbing is living? So confused. WV: angly. If my husband had had a groom's cake like these, I would have been plenty angly. With a travesty such as this at your wedding, it any wonder few take their marriage seriously? Catherine: "Okay, this has been bugging me since yesterday. How does the guy with no big toe wear flip-flops?" Good point hahaha! I guess I meant sandals. I like the hunter's cake, especially the safety orange frosting border. And the army cake could well be for someone in the Army or Marines whose platoon motto is "Git 'er Done!" I'd have asked for an upgrade on the flotsum, myself, but the cake is not bad in itself, IMHO. maybe that cake (#2) ties into the menu. You know, Elk Steaks, Deer Meat (can't spell venicine? )something or other? you know in some parts that is classy! I learned something very important today. 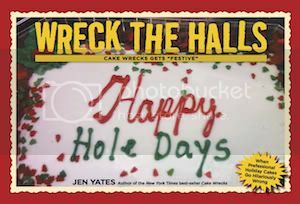 Don't read Cake Wrecks while still recovering from food poisoning. Blergh. I can't believe no one picked up on the deer cake......I think it is hilarious that the guy in the photo is holding the deer up by its rack. "Nice rack ya found there, bud!" Reference to deer or bride? Granted, the entire concept is completely intolerable, but noticing that just cracked me up. LOL! My son and I were just looking at your photos when he said what's that mommy? (pointing to the last photo of the foot missing a toe" I said "that's a cake in the shape of a foot". He then proceeded to look closer and declare. . . "no mommy that's not a foot cake, that's a jelly fish!". the thing kids say. Here, and I thought maybe the bride and groom really liked "Stripes" with Bill Murray: "Sgt. Hulka, you're our big toe." I do know the toe guy (I might start calling him that now) and I was at that wedding! he's not obsessed with the toe of course, it's just kind of an interesting thing about him, and the bride was totally on board for having the groom's cake in the shape of his foot. We all thought it was funny, and I still tell people about it even 3 years later. The family has a somewhat dark sense of humor so no one was weirded out. Maybe it was a reminder to "toe the line." Haha. Thanks for the above. But it's not about whether I approve of a wedding that makes it great or terrible to me: it's whether the couple did something they loved, or if they just did the "normal" stuff because they felt they "should". I'm happy to attend a Wedding Industrial Complex-tacular white tulle and boring cake extravaganza if that's really what the bride and groom *want*. ...that's when I get all annoyed. So yeah. That foot cake is ugly because it's ugly. The deer with the "nice rack" and the SpongeBob Git-R-Done are horrid. But not because they're bad "for a wedding": they're just bad. Just like most "normal" wedding cakes are, to some people, also kind of ugly. And I still don't get why it's the groom who gets the fun cake while the bride is supposed to pick the boring, tasteless one with all the frosted flower crap on it. Best regards from South Germany, I love this blog. I totally thought that last cake was a tribute to LOST (the four toed statue...) It would have made for a better story than "our grooms cake was a tribute to my husband losing his toe.."
At first I thought that the deer picture was of a guy posing with a live deer at a petting zoo as a joke. I want to remain innocent. Bunny Lebowski complete with green sparkly toenail polish (icing, of course, and not really nail polish) and a visible toe bone. It was HUGE sheet cake that the groom proudly boasted cost more than the actual wedding cake. Yowza. Can you do a Sunday Sweets column about Groom's cakes? I've never heard of the tradition before cakewrecks, so I'm getting the impression that it is a fundamentally flawed genre, like the pregnant woman shower cake. does the toeless guy have really bad ankle edema too? I, quite possibly, went to high school with the Severed Toe Cake couple. Unless another 9-digit benedict had this arranged (also taking the lawnmower accident into account). "And the toilet cake was exhibit A of her divorce proceeding." Ewww..I'm grossed out about how shiny the foot is. Makes me wonder if these grooms designed their own cakes. Or if someone else while drunk at the bachelor party thought, "No grooms cake? I've got to fix that!" 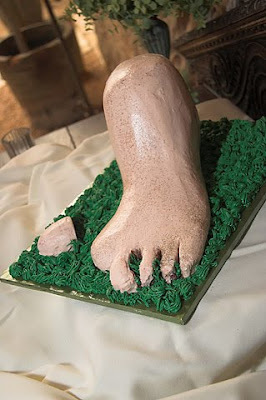 If I'd lost a toe in a childhood accident - I would NOT want it memorialized in cake on my wedding day, regardless of how well (or in this case poorly) it was done. The Big Whoop cake is actually a big whoopie pie! I lived in New England for a few years and these are quite a popular and delicious treat! It is a soft cookie sandwich with vanilla cream in the center. So it is one of their creative sayings when they say Big Whoop on a whoopie pie! Hope that helps clarify things a little!